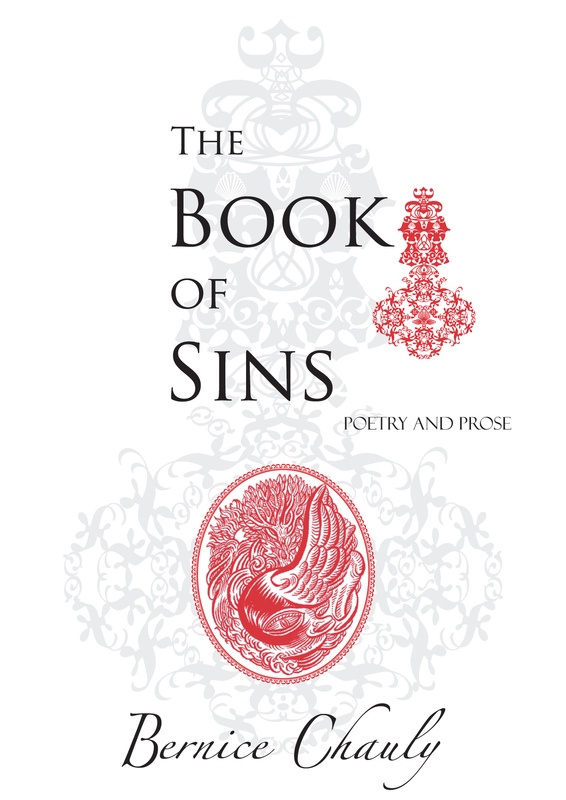 In Bernice Chauly’s small but substantial collection of poetry and prose, The Book of Sins, words indeed rage forth from the page, and they do so with a searing yet unembellished forcefulness. It’s hard not to note, first and foremost, the urgent, pounding rhythm to some of the lines in this collection. In This Love, she writes “And she in her silence prayed that it would stop, that he would stop that he would realize that it was enough, that it was enough.” Each phrase crashes with a sort of drumbeat intensity. Each phrase hits directly at a nerve. Other poems are distinguished by a stark immediacy. “Sweet Jesus, she cannot breathe” starts off the piece entitled Haze. A distinctly female voice emerges from this book. Taken together, these particular poems exude a somewhat predictable brand of old school feminist angst: sisters, we have suffered for too long, let us take up arms. To me, those words, from the poem entitled Like He Once Said…, are a richer expression of the female than all references to virgins, mothers and prostitutes combined. Bernice is not absolved of certain literary indulgences — poems that sound like confessionals (“I drink too much now/I cry all too much now”), or those that revel in their own melancholy (“Art is pain and pain is art”). Even the juxtaposition of carnality and religion — some of the chapters are named after a number of the Seven Deadly Sins (Pride, Gluttony, Lust) — is somewhat expected. But often, she gives her words enough color and enough truth to keep us with her, so that when she writes “and as the children slept I drank wine, smoked/while pounding pencils into powder on paper”, what comes across is not poetic affectation but words spoken in confidence. The strength of this book is that she sounds like she has lived these words. At times, she crosses the threshold between poignance and misty-eyed sentimentality. Poems that touch on social issues, in particular, tend to lack the shades of meaning and the contemplative tone that distinguish some of her other pieces. The strongest works in the book are the poems that sound less polemical, and more personal, when anger and heartbreak are expressed more as a sigh than as a rant. Some poems derive their texture from details (“the swing/you brought from the house/in Taiping -/it was white then”). Others are striking for their intimacy: “Between sheets/between breaths/between skins/That sometimes/met in secret” reads like an entry to a diary that someone has hidden under a clean white pillow. It would have been too easy if she dwelled merely on her maternal instincts. Traditionalists might scold her for it, but it says a lot about her honesty as a writer. Gabrielle Low is a writer and editor. Her contributions to Kakiseni include articles on culture and visual art. The Book of Sins is available in most major book-stores at RM24.00 per copy. Related post: The Book of Sins is out!